As I stated in my previous post, I will start updating my blog with some trip reports, back-dating to about middle 2009 to try and give you a better sense of my travels and the development of my photography over the years. As these trip reports become current, I will try and also keep up to date after recent ones. This will also force me to process the masses of images still lying on my hard drives. We had planned a week-long trip (8 nights) to this iconic park as a way to get re-acquainted with the place. I had last been here in 1995 as a lad in 7th Grade (with my folks). Back then we had promised as a family to return every year...but we never did. This time, with me having my own family I decided to honour that tradition. I can also duly say that after this initial comeback trip, have stuck to the tradition of returning at least once per annum, as this amazing place surely warrants it. First off, this trip was a planning and packing nightmare. We were 2 couples, had to bring all our food and also all our camping equipment as a good part of the trip would be spent camping. This is how we had to pack my Nissan X-trail that I was driving at the time. Any other packing configuration, with one item not in its place, resulted in something left on the ground with no space to put it! 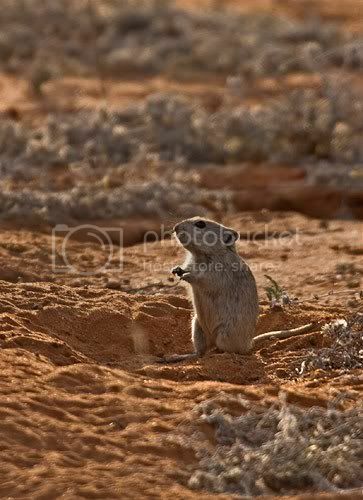 We started off our Kalahari trip like most visitors here do, by staying over in the main entrance camp, called Twee Rivieren. Here we had to set up camp, which luckily went quickly with everybody pitching in. Our first afternoon's drive didn't deliver anything exciting, but I found this Whistling Rat quite cute. Sunset was a blinder this evening! The next morning, we made sure were out of the gates at first light. 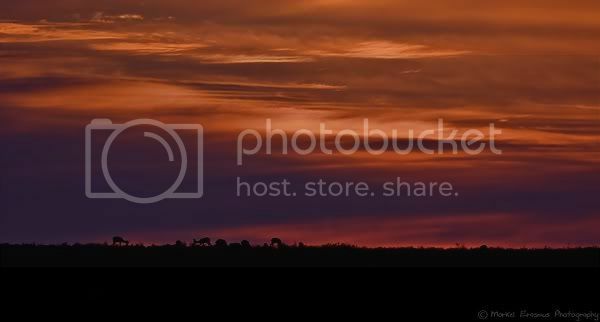 The dawn awaited us...with some springbok gazelle grazing on the ridges of the dunes. We hadn't gone 1km from the camp, when we spotted movement next to the road. 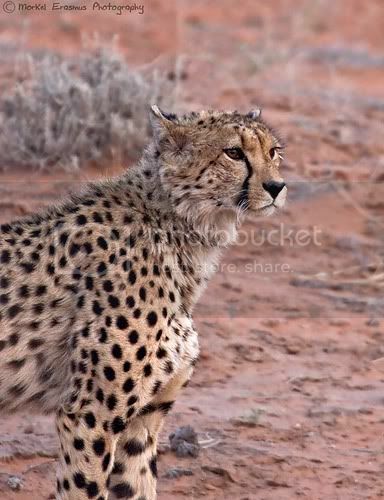 Cheetah!! 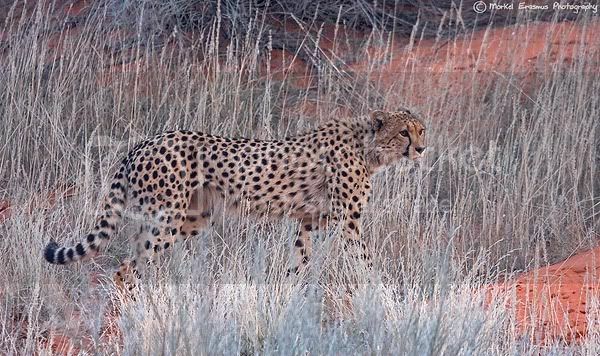 It was a lone male, walking purposefully, no doubt in search of an early morning meal. 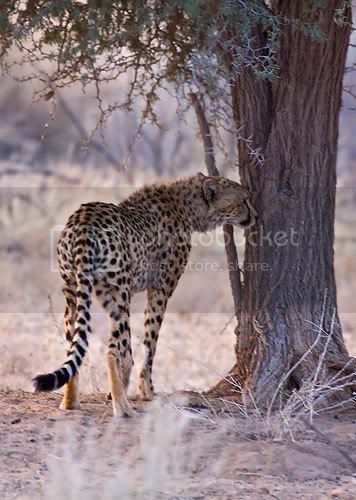 He crossed the road and smelled the nearest tree trunk where another Cheetah had probably left a scent-marking the previous day. 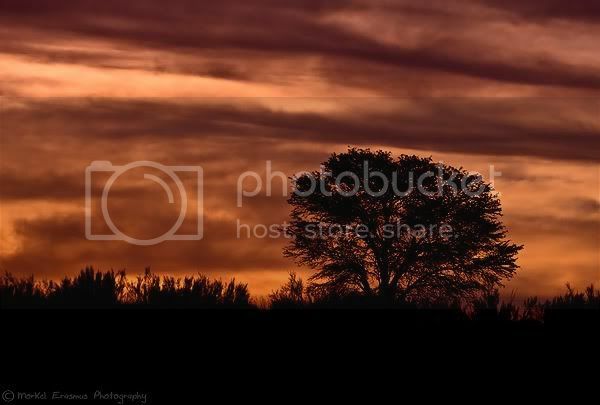 The sun wasn't even up yet, and the Kalahari had delivered! Twee Rivieren is directly translated as "Two Rivers", with good reason. 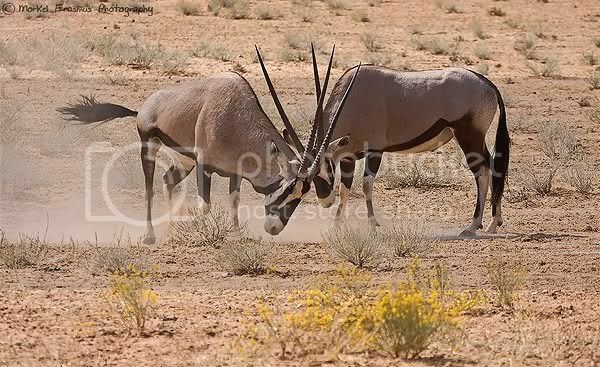 Most of the driving roads in the Kgalagadi are set within the arid riverbeds of the Auob and Nossob rivers. Shortly after leaving Twee Rivieren you are faced with a decision - either go north towards Mata-Mata and the Namibian border in the Auob river, or go Northeast towards the Botswanan side in the Nossob river. On this morning we were forced to take the Auob as a large section of the road between Twee Rivieren and Nossob was under re-construction. 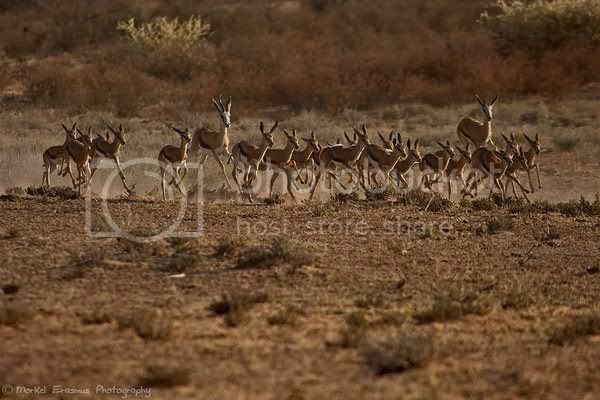 We soon came upon a large herd of Springbok gazelle going about their business. This business included males play-fighting and the young fawns running up-and-down the riverbed. It was great fun to watch. I also ticked off my first sighting of Pygmy Falcon here. 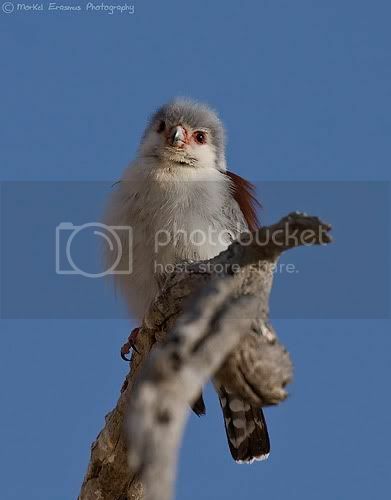 This is Africa's smallest raptor. 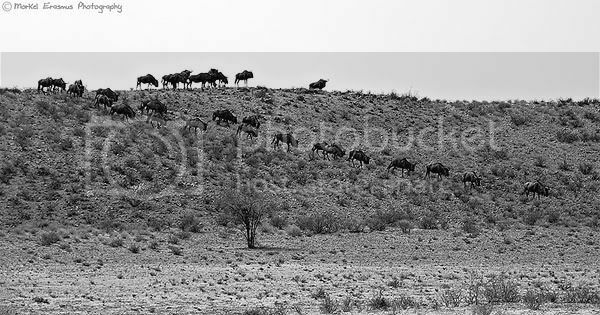 Blue Wildebeest are very common in this part of the world. 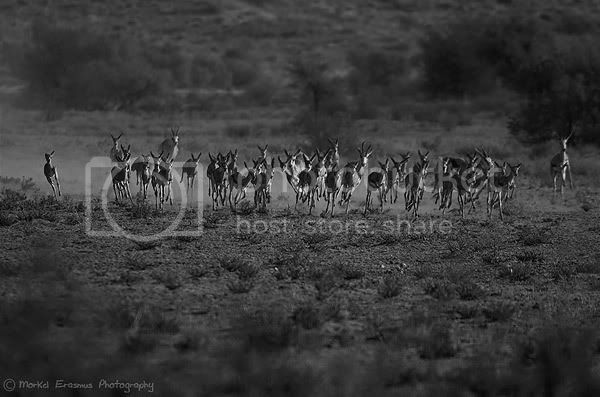 This herd was coming down from the dunes into the Auob riverbed to slake their thirst. 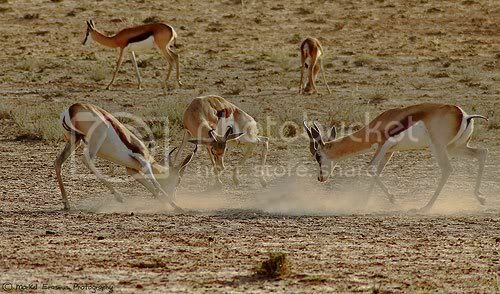 The old name for this Park (for the South African section) was the Kalahari Gemsbok National Park. 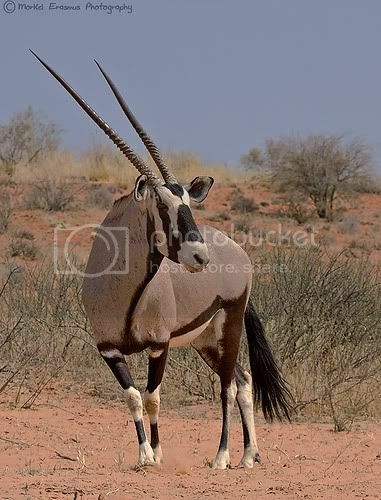 Gemsbok is a southern African term for our local genus of Oryx. Needless to say there are quite a few of them in the Park. 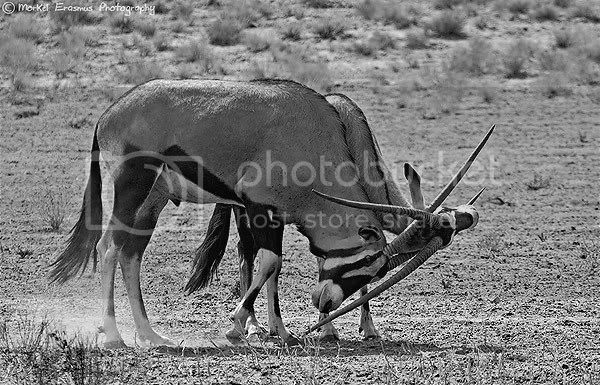 Gemsbok/Oryx actually don't need standing water to survive here. 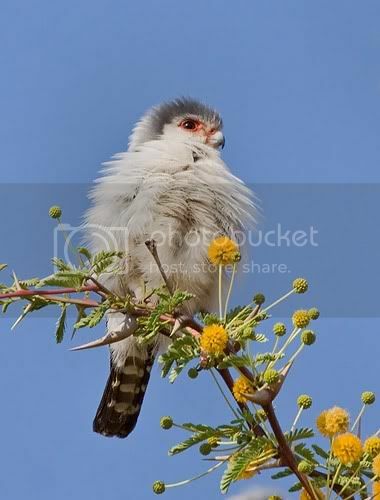 They get enough of their moisture from the dew in the mornings and they also have an internal cooling system whereby they can regulate their body temperatures by altering their breathing. These 2 were having a tiff. 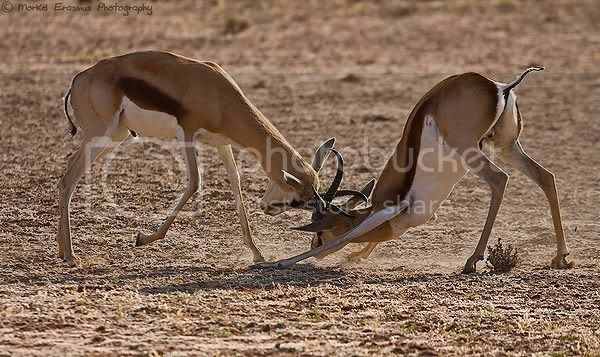 With their rapier-shaped horns, it's no wonder that they can provide a deadly blow to predators who threaten them.